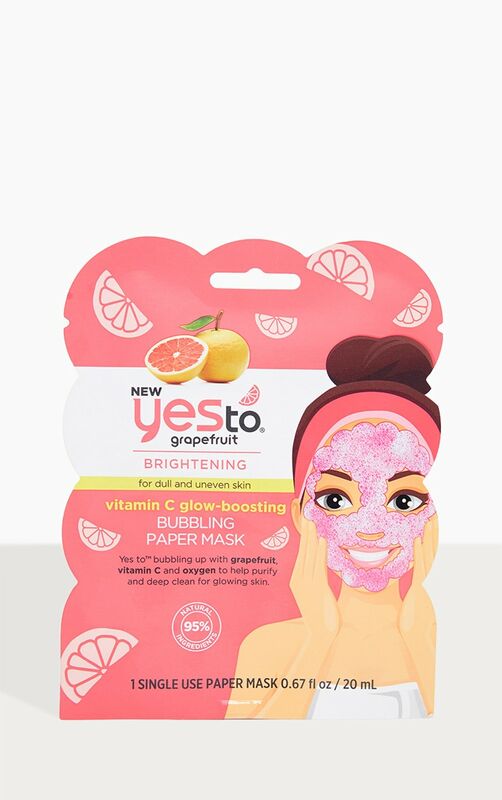 Yes to bubbling up with grapefruit, vitamin C and oxygen to help purify and deep clean for glowing skin. Aloe Barbadensis Leaf Juice, Decyl Glucoside, Sodium Lauroyl Sarcosinate, Sodium Lauryl Sulfoacetate, Methyl Perfluorobutyl Ether, Methyl Perfluoroisobutyl Ether, Cocamidopropyl Betaine, Cetearyl Alcohol, Glyceryl Stearate, Benzyl Alcohol, Prunus Armeniaca (Apricot) Kernel Oil, Citrus Grandis (Grapefruit) Seed Extract, Citrus Aurantium Dulcis (Orange) Peel Extract, Stearic Acid, Sodium Lauroyl Glutamate, Sodium Phytate, Glycerin, Sodium Ascorbyl Phosphate, Tocopherol, Achillea Millefolium Extract, Arctostaphylos Uva Ursi Leaf Extract, Calluna Vulgaris Flower Extract, Glycyrrhiza Glabra (Licorice) Root Extract, Scutellaria Baicalensis Root Extract, Solanum Tuberosum (Potato) Pulp Extract, Sophora Japonica Flower Extract, Potassium Sorbate, Sodium Benzoate, Citric Acid, Sodium Chloride, Ethylhexylglycerin, Phenoxyethanol, Fragrance (Parfum), Citral, Limonene. 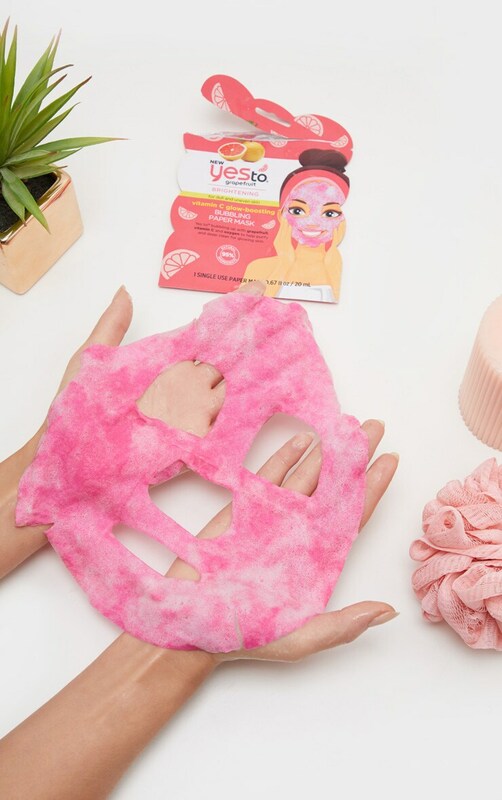 Gently unfold mask and apply to clean skin. Adjust around eyes, nose and mouth, smoothing to fit the curves of your gorgeous face. Magically watch the bubbles appear! Close eyes and relax for 10 minutes. Remove mask and rinse.